← Why Is Cello Amazing? the words/ to your favorite song/ you can’t believe it, you were always singing along/ it was so easy, and the words so sweet/ you can’t remember, you try to feel the beat..
It’s been a little bit between updates, but a lot has gone on Cello-wise! When I was thinking about this post/a little breakthrough we had, the Regina Spektor song (above) got stuck in my head. When I was riding multiple horses a day, and living (breathing) the horse world, this basic stuff came so EASY. And though certain things might be in your head, you just can’t do it after years off. A few rides ago we schooled in the “ring.” I have to admit, this was a cop out after the mountain lion encounter because I didn’t have my gun. We had a mini-breakthrough though! I say mini because it isn’t rock-solid by any means, but Cello gave to my inside leg, and his corners and overall steering was much nicer. This was thanks to me actually asking correctly, having correct leg position and the ability to use my inside leg actively. Easy, basic “English” stuff- stuff that’s like forgetting the words. We kept it at a trot, and I was especially happy to have the give when going to the right. During that ride Dana came down from the ranch house to let me know kids were coming to the ranch. Kids!!! Oh no!! Just kidding, it was great for Cello. His future lies as a therapy horse so I was excited to have little minions to throw on his back. He handled it all like a pro- when the cars pulled up, two kids got out with an entourage of adults and suddenly the scary orange tractor was going, the four wheeler was going, and a little girl headed straight for Cello after being told she could have a pony ride. It is worth mentioning that while this was on-going a THUNDERSTORM was rolling in the background. A little thunder? Not enough to faze this pony. On the 4th of July my best friends came out to the ranch with their little 2 year old to give the horses some loving. We were short on time, so Henrik didn’t get a pony ride that day, but he was excited to be able to pet Cello. He got his ride the night before last! We gave Henrik the reins (Eric had a clipped on lead) and he definitely thought he was a little cowboy. He kept saying “yee haw” with EVERY BREATH. Literally, every breath. Talk about too cute. 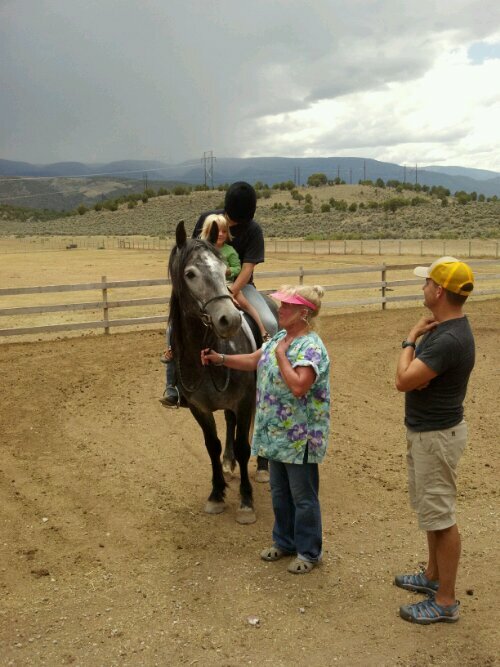 Don’t mind my hunched position there- it’s hard to hold a kid in front of you in an English saddle!! P.S. Almost forgot to mention, Emilee and her boyfriend are planning on coming up this weekend. 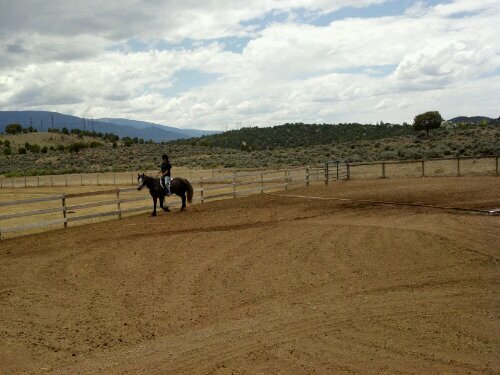 Trail rides & real arena time, here we come! This entry was posted in New Things/Breakthroughs, Trust and tagged Blm mustang, Cello, Dani Neumann, Extreme Mustang Makeover, Goodboy, skylark horse programme, wild horse project. Bookmark the permalink.